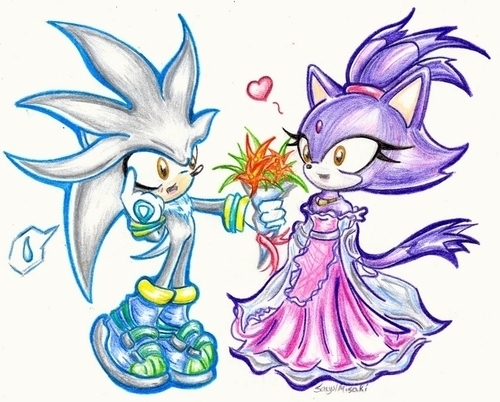 Silver love's Blaze. . Wallpaper and background images in the Blaze the Cat club tagged: silver blaze cat hedgehog the. AAAWWW i love this photo is soo cute is soo perfect soo romantic!!!! Adorable! I luv dis couple SOOOO much! WAIT SHE HAS A DRESS ON EWWWWWWWWWWW NOPE NO WAY WILL SHE EVA WEAR A DRESS EVA!!!!!!!!!!!!!!!!!!!!!!!!!!!!!!!!!!!!!!!­!!!­!!!­!!!­!! i remember that, that was a fire flower! You light them up and then it's like a mini fireworks show! those things were spectacular! ah the fire flower. i still have it in my room,next to the dress. That was the best day ever! princess blaze looks nice! I think silver's lucky. GRRRRR!THAT NEEDS 2 B SHADOW NOT SILVER!